Patriarch Beshara Boutros al-Rai, head of Lebanon’s Maronite Church, is accused once more of dancing with wolves over Syria. The blame comes today from Tariq Alhomayed, editor in chief of the leading Saudi daily Asharq Alawsat, after declarations the patriarch made in an interview with Reuters. Rai was at the center of a nationwide political storm in Lebanon last September over controversial statements he made on Syria during a visit to France for talks with President Nicolas Sarkozy. He told reporters at the time President Bashar al-Assad should be given a chance to carry out political reforms in the face of protesters demanding his ouster. He also warned the rise of the Muslim Brotherhood in Syria would threaten the presence of Christians there. 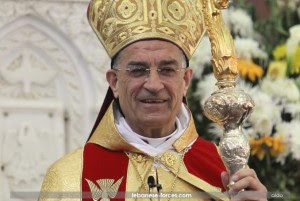 The statements attributed by Reuters to Lebanon’s Maronite Patriarch Beshara Boutros al-Rai on the situation in Syria and on the status of Christians in the region are alarming. That’s a weird remark, for who drove out Iraq’s Christians? Al-Qaeda? If so, al-Qaeda wreaked havoc in Iraq with the support of Assad’s regime and Iran – the two patrons of Rai’s neighbor Hezbollah. Rai is probably unaware that Iran gave refuge to Osama Ben-Laden’s sons, Saif al-Adel and others. Isn’t it odd that Iraq’s Christians were in better circumstances under Saddam Hussein than they are today under Iran’s darling government of Nouri al-Maliki? That’s a provocative declaration that serves absolutely no one. Indeed, which Arab regime killed 10,000 of its citizens? Does Rai mean Moammar Gadhafi? Where is Gadhafi now? He got what he deserved and has met his God. Does he mean Saddam? And where is Saddam now? Does he mean Ali Abdullah Saleh? Also, where is he now? Or does he mean Hosni Mubarak and Zine El Abidine Ben Ali? They did nothing compared to Assad. Even the Syrian opposition fared better than Rai by challenging a provision in the new Assad-drafted constitution that the president of Syria must still be a Muslim. Rai’s words were accusatory and erroneous… His discourse was flawed because he implied that what was a “spring” in the region turned into a “winter” when the Syrians revolted. He echoes the position of Iran’s Supreme Leader, Hezbollah and the Maliki’s regime. One final question to Rai: Who killed Lebanon’s leading Christian figures since 2005? Al-Qaeda? It is so sad to see clerics, irrespective of their religions, turn their back on innocent souls!